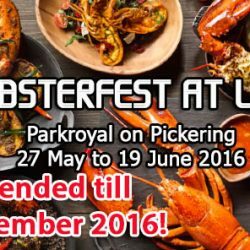 It's claws-galore at Lime as lobsters take centrestage with their 'Lobsterfest' dinner buffet that's enhanced and refreshed to wow foodies once again! Enjoy a taste of zesty Limenade with an eclectic mix of Maine Lobsters prepared in various International and Asian styles. Happening from now till 1 December 2016, make your reservations now!